Published: Mon, January 2, 2012 @ 12:03 a.m.
D&L Energy Inc. is best known for its brine-injection well in the city that is suspected of triggering 11 Mahoning Valley earthquakes this year. But a Vindicator investigation conducted prior to the well shutdown Friday and Saturday’s magnitude-4.0 earthquake revealed the company has a history of at least 120 violations at 32 injection and extraction wells in Ohio and Pennsylvania during the past decade. Environmental regulators have levied violations against D&L for administrative flaws such as a failure to display a permit but also for environmental mistakes such as water and soil contamination and pollution. Injection wells, a byproduct of fracking, have been linked to small earthquakes and often are targeted for other environmental concerns. Fracking is a process in which water, chemicals and sand are blasted into rocks thousands of feet below the ground to unlock natural gas and oil. That brine-water mix is then disposed of in injection wells. D&L, which formed in 1986 and is expanding its presence in the Mahoning Valley, acknowledges that compliance with state standards was a problem in the past, but company officials say they are trying to go the extra mile to gain community support. “We’re not this bad guy out there trying to create havoc with the water and with people’s property,”said Ben Lupo, owner and CEO of D&L. Though both Ohio and Pennsylvania environmental regulators have cited the company with violations in the past year, Tom Tugend, deputy chief of the Ohio Department of Natural Resources, the department that regulates wells and collected more than $1 million in taxes from injection wells during the first 9 months of 2011, said D&L is cleaning up its act. It was at the Coitsville well site Nov. 21 — the same day ODNR Geologist Tom Tomastik visited the township to field questions from concerned residents about the well — that there happened to be a mud spillage. Drilling mud is used to help keep the drill bit clean and regulate its temperature. The spillage drained into an open field near the well site and in the direction of a body of water behind The Purple Cat, the nonprofit, private agency that offers day programs and work opportunities for people with disabilities. The water had higher-than-normal chloride levels and had a pH level between 12.5 and 13. Distilled water, for comparison, has a pH level of about 7. Bleach has a pH level of about 13. ODNR issued a compliance notice —called a notice of violation before 2011— and required D&L to vacuum the drilling mud and remove any contaminated soil; D&L did both within 24 hours. A large mound of the contaminated soil still remains at the site; D&L is waiting for approval from a landfill to accept it. The violation was the first at any of D&L’s new Valley sites. It plans to have operations in Youngstown, Girard, Campbell, Coitsville, Hubbard, Springfield Township, Beaver Township and in Columbiana County in East Liverpool, Fairfield and Elk Run townships. The state regularly administers more than 1,000 notices of violation on the state’s 68,000 wells, which include about 190 injection wells. On Dec. 16, a resident’s claim led to another site inspection, this time because of a sagging pit liner. ODNR did not file a violation notice because it said no fluid had left the pit. In one instance, at a well in Portage County’s Shalersville Township, it took D&L 26 months to comply with ODNR orders regarding an oil-and-brine spill. During that period, ODNR’s Division of Mineral Resources Management filed 14 notices of violation against D&L, which at the time owned the well. It had been constructed in 1984 by B&S Gas & Oil, according to state records. State environmental regulators learned three storage tanks containing oil and brine overflowed on June 21, 2004. A dike is built around storage tanks to protect against the spread of possible contaminants. But in this case, the fluid level exceeded the dike’s capacity. According to a notice of violation, a D&L employee told an ONDR inspector the fluid overflow had happened three weeks before. The report notes that “no effort” was made to clean up the spill inside or outside of the dike, so ODNR told D&L to cease all site operations. On Sept. 9, 2004, about two months later, after five more violation notices, an ODNR representative scheduled a meeting with Lupo, D&L president. Lupo didn’t show up to the meeting and did not return ODNR’s repeated calls, according to ODNR records. Lupo, however, recalled the matter differently. ‘’They never called me,” he said. On Nov. 10, the state presented the company with a list of 11 issues to be corrected before it could resume operations. But according to ODNR records, the company did not complete those actions until Aug. 23, 2006 — 26 months after the first notice of violation. The Portage well is no longer operating, according to ODNR records. 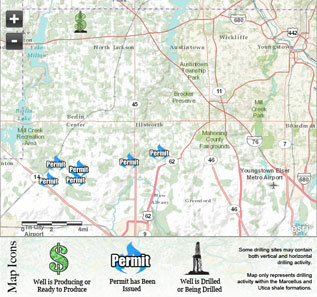 D&L, which also deals with extraction wells, has a history of 23 violations in Pennsylvania. In 2003, the company had nine violations at six wells, according to an evaluation from the state’s Bureau of Oil and Gas Management. One well in Mercer County’s West Middlesex Borough, was found to have sediment discharge into a tributary that carried water into the Sh enango River. Like the Portage County well, an inspector made multiple visits, but nothing had changed. Since 2008, D&L has accumulated 14 violations in four years, some for environmental safety reasons and others for administrative violations, such as not properly displaying a permit. The latest violations came in June, when an inspector found that production equipment at a Crawford County, Pa., site “leaked or overtopped,” dumping “a large volume of oil and brine” into a dike. The state inspected D&L wells on three occasions in 2011 and cited the company with three violation notices. “I would say we’re just going to have to move a little quicker,” Lupo said. Lupo, who has spoken publicly about D&L’s wells only on a handful of occasions, said many past snafus were a result of less-than-stellar well construction. That hasn’t stopped some, such as Diana Ludwig of Clarion Pa., from protesting the site of one of D&L’s newest wells, in Hubbard Township at the corner of Main Street and Hubbard Masury Road. Legislators such as state Rep. Robert F. Hagan of Youngstown, D-60th, have also called for a moratorium on all drilling operations, including injection wells. But Lupo, stressing his community ties, said D&L will install steel pits in Hubbard, unlike the plastic liners at Coitsville.